Basal salt mixture containing micro and macro elements as described by Gamborg, et al. (1968). Package contains 3.05 grams of powder per liter of medium. Basal salt mixture containing micro and macro nutrients as described by Kao & Michayluk (1975). Basal salt mixture containing micro and macro elements with vitamins as described by Linsmaier & Skoog (1965). 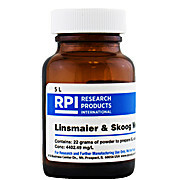 Package contains 4.4 grams of powder per liter of medium. Hygroscopic. Powdered mixture as described by Gamborg, et. al. (1968). 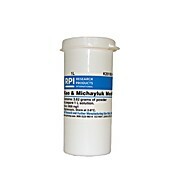 Package contains powder vitamins to prepare of a 1000X vitamin stock solution. 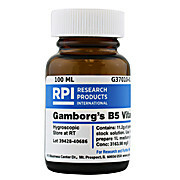 Use 1 milliliter vitamin stock solution to prepare 1 liter medium of final vitamin concentration. 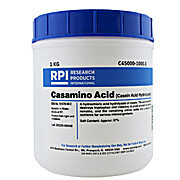 Casein Acid Hydrolysate is a hydrochloric acid digest of casein that contains small amounts of cystine and Tryptophan. All vitamins have been eliminated by the acidification treatment. 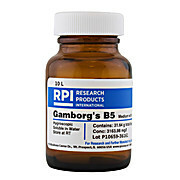 Provides a source of amino acids as nutrients for growing various organisms tolerant of high salt conditions. Hygroscopic. 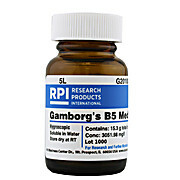 Basal salt mixture containing micro and macro elements with vitamins as described by Gamborg, et. al. (1968). Package contains 3.16 grams of powder per liter of medium.